One out of 5 children in Singapore have eczema. According to BabyCenter, about 60% of cases continue into adulthood, while most babies see an improvement in their symptoms by their second birthdays. Many children also outgrow the eczema. Infant eczema (or atopic dermatis) is a dry, thickened scaly skin rash often appearing on a baby’s scalp, face, arms, legs, or even the entire body. Some babies are prone to develop eczema in the first year of life as they have delicate skin. If either of the parents have eczema, asthma or an allergy, the baby’s eczema is most likely hereditary. 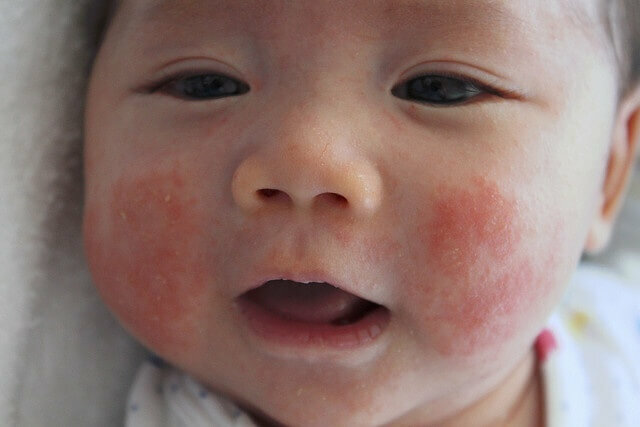 Although eczema is not necessarily an allergic reaction, it may be triggered by allergens in the baby’s diet or the mother’s milk (through breastfeeding). Other triggers of eczema may include environmental changes such as asudden change in temperature or heat. My eldest daughter developed eczema in her first few months of life. Initially they were tiny red bumps which we assumed were baby acne or milk rash. It progressed into wet eczema, where the rash oozed with pus. We then found out that the eczema was caused by an egg allergy. I had to avoid egg in my diet as I wanted to continue with breastfeeding. With close adherence to the treatment plan, she eventually outgrew the allergy by her 1[SUP]st[/SUP] birthday. My son has also developed eczema and we are still following the treatment plan. If you feel that the primary treatment does not reduce the symptoms, get a referral to a (pedeatric) dermatologist. You can visit a polyclinic to get a doctor’s referral, or directly to either Kandang Kerbau Hospital or National Skin Centre (NSC) as a private patient. If you suspect the eczema is caused by food (either directly or through your breastmilk), request for a skin prick test to be done. It takes only 20 minutes to obtain the results at the lab. Your baby’s skin will be pricked with a few allergens and any swelling will be noted. Your baby may feel uncomfortable from the pricking, but both my children showed no discomfort. Follow closely to the treatment plan. Keep your baby’s skin moisturized and use mild & fragrance-free soaps and detergents. Doctors may even advice bathing your baby only once a week. Prevent your baby from scratching his/her skin. Keep nails short and clean, and use cotton socks or mittens to cover the hands. Dress your baby in cotton clothing, which allows the skin to breathe and is less irritating to the skin.· If you are breastfeeding your baby, there is no need to stop! Some doctors believe that eczema may also develop in babies with a weaker immune system, so continue to breastfeed your baby to boost his/her immune system!